One of the great explorers of the 20th Century was the Norwegian ethnologist Thor Heyerdahl. He believed that prehistoric societies were capable of trans oceanic travel and trade. He would point to similarities in language and artifacts on different continents as well as legends of great sea voyages as evidence. In 1947 Thor and a small crew set sail across the Pacific on a balsa wood raft to show that Polynesians may have originated from South America. In latter years he sailed an Egyptian type reed boat, the Ra, across the Atlantic to South America. His book “Kon-Tiki” is a true exploration classic, still in print its one of the touch stones of my generation. Get a group of people of a certain age together and you can bet a large percentage would have read it. I think it must have been in every school library in Australia. Of course none of these expeditions prove prehistoric societies actually had intercontinental trade. Although the discovery of traces of nicotine and cocaine in the mummy of Ramses II and tobacco beetles in Egyptian graves sure appear convincing to a layman like me. However, the Kon-Tiki and Ra expeditions traveled with the prevailing currents and winds, they were one way journeys, If transoceanic trade was possible then the vessels had to get back. Now another group of explorers are trying to show two way trade was possible. The Abora III expedition is trying to sail a reed boat from North America to Spain. Now a ten-person crew including Tormod and led by Dominique Gorlitz is out to prove that others may have taken that historic intercontinental voyage far before Columbus — up to 14,000 years ago — by crossing the North Atlantic in a prehistoric-style boat made of reeds. 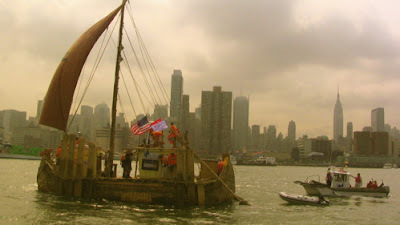 Gorlitz and his crew left port in New York City bound for Spain in the ABORA III, a boat made from reeds harvested at Lake Titicaca in Bolivia. Since its July 11 departure, the boat has traveled 188 miles into the Atlantic. Aside from the heady implications the completion of their voyage could entail, first the crew needs to deal with the crossing itself. Certainly a successful voyage would show that primitive boats were capable o the trips but of course , not prove it was actually done. To my mind there remains one big question, how did they navigate? Could ancient sailors successfully navigate the Atlantic to allow trade? I realize the Polynesians could sail the Pacific without instruments but the Atlantic is a rough ocean I'm not sure their methods would be suitable. Maybe they did have instruments after all. Crichton Miller makes the case that the ancient Celtic Cross was a navigation tool. Perhaps it was, or perhaps Mr Miller is being too imaginative. I not qualified to have a proper opinion but as recent discoveries show the ancient world can surprise us .